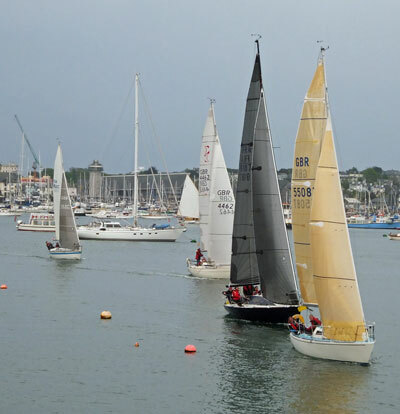 Race Officer Mike Swingler started the seventh & last of Flushing Sailing Club’s Skinners Brewery Tuesday Series on a breezy, lumpy and rainy Carrick Roads. A season’s best 31 boats came to the start line with overall silverware and bragging rights subject to close competition in both Q & U Classes. Q Class composed of eleven of the faster yachts had a 7.8 mile course including an excursion in to St Mawes and were led home by Robbie Tregear in Per Elisa showing good form in advance of the Henri Lloyd Half Ton Classics Cup being hosted by FSC in August. Second was Martin Eddy in Temeraire followed by John Fox on the evergreen Sigma 33 Excelle. Overall the series was won by Excelle, with Temeraire second & Encore, David Cunliffe, third. U class with a stonking 12 boats enjoying the boisterous conditions, had a 6.1 mile course into the south westerly within the Carrick & Cross Roads. The two Nordic Folkboats Gap Year sailed by Len & Annie Trenoweth (get well soon Teresa) and Aurora helmed by Mandy Owens had a fine old tussle all the way around with Wilkie, a GK24, sailed by Bob Chapple and various reprobates. Gap Year beat Aurora by 16 seconds with Wilkie coming in close behind. The whole fleet came off the water smiling and it was great that several boats started for the first time this season. Overall Aurora won the series followed by Trifle owned by Chris Jelliss and third was Wilkie, these three boats sharing the seven race wins between them. Four Class B working boats had a good sail being led home by Grace helmed by Dan Tregaskes & the happy crowd, second was Artie Williams helming Winnie followed by Florence over from Turkeyland. Pixy helmed by Lyulph Hesling won in the Sunbeams. Two boats raced in the white sail yacht class with Amneris, David Layton, beating Thirteen sailed by Robin Roebuck. Sweet Friday owned by Len Cheshire won the series. A big thank you to the Series sponsors Skinners Brewery who are big supporters of the Sailing Club and whose products were certainly being enjoyed in the Clubhouse afterwards.